A man wearing a T-shirt depicting a cartoon character holding a gun was stopped from boarding a flight by the security at Heathrow's Terminal 5. 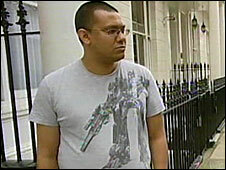 Brad Jayakody, from Bayswater, central London, said he was "stumped" at the objection to his Transformers T-shirt. "He says, 'we won't be able to let you through because your T-shirt has got a gun on it'," Mr Jayakody said. "I was like, 'What are you talking about?'. "[The official's] supervisor comes over and goes 'sorry we can't let you through and you've a gun on your T-shirt'," he said. "I was just looking for someone with a bit of common sense," he said. "It's a cartoon robot - what threat is it to security or offensive to anyone at all?" A BAA spokesman said there was no record of the incident and no "formal complaint" had been made. "If a T-shirt had a rude word or a bomb on it, for example, a passenger may be asked to remove it," he said. "We are investigating what happened to see if it came under this category. "If it's offensive, we don't want other passengers upset."